"Spider-Man (soundtrack)" redirects here. For the soundtrack album containing songs in the 2002 film, see Music from and Inspired by Spider-Man. 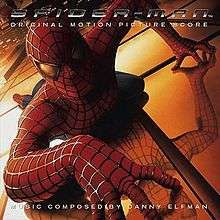 Spider-Man: Original Motion Picture Score is the soundtrack for the film of the same name directed by Sam Raimi. It was released on June 4, 2002. The score combines traditional orchestration, ethnic percussion and electronic elements. A CD release of the score came out from Sony's label. ↑ "Danny Elfman's Original Motion Picture Score". Sony. 2002-06-04. Retrieved 2006-11-07.